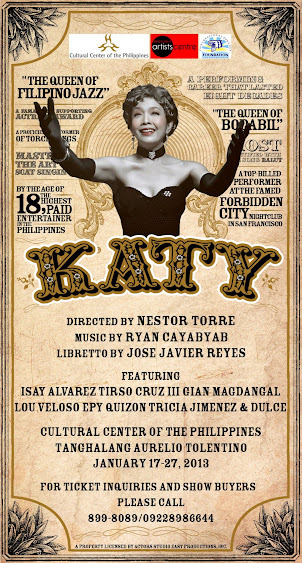 Be part of the Filipino Musical, Katy, as Cultural Center of the Philippines, Spotlight Artist Centre and Congressional Spouses Foundation will be holding auditions at Spotlight Artists Centre, Basement, Doña Consolacion Building, 122 Jupiter Street, Bel-Air Village, Makati City, November 6. Aspiring actors need to bring a resumé, a minus one (for the song number) and must prepare one dance from any musical. They need to be at the venue before 2:30pm as the audition will be from 2:30pm-4pm. This entry was posted in Stage Play and Theatre and tagged Congressional Spouses Foundation, Cultural Center of the Philippines, Dulce, Epy Quizon, Gian Magdangal, Isay Alvarez, Isay Alvarez-Seña, January 17-27, January 17-27 2013, Joey Reyes, Jose Javier Reyes, Katy, Katy The Filipino Musical, Katy The Musical, Little Theatre, Lou Veloso, Mr. C, Mr. Ryan Cayabyab, Nestor Torre, Ryan Cayabyab, Spotlight Artist Centre, Tanghalang Aurelio Tolentino, Tanghalang Aurelio Tolentino (Little Theatre), Tanghalang Aurelio Tolentino (Little Theatre) Cultural Center of the Philippines, Tirso Cruz III, Tricia Jimenez. Bookmark the permalink.